Anjue Si, Kangding, originally uploaded by jiulong. It all started more than 12 years ago, after my first trip to China. 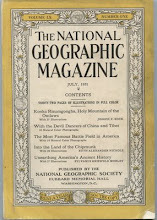 Enthused by the mountain scenery I had encountered on a hiking trip near Dali in Yunnan, on my return I browsed through some ancient copies of National Geographic magazine in the local library, looking for other interesting places to visit in China. Among the articles on the Great Wall and Suzhou’s canal’s, I came across one by an eccentric Austrian-American botanist called Joseph Rock, describing a trip he had made through the Sichuan-Tibetan borderlands of Sichuan from Muli [木里] to Kangding [康定] in 1929. "The scenery hereabouts is overwhelming grand. Probably its like cannot be found elsewhere in the world. Where Muti Konka rears its eternally snow-capped crown 19,000 feet into the sky, the Yalung flows 12,000 feet below..."
passes in blinding snowstorms, carrying their food with them..."
I was intrigued by these claims and tried to find out more about the canyon and its grand scenery. However, after consulting maps and guidebooks, and in subsequent years trawling the internet, I could find no mention of “Muti Konka” or the canyon. Joseph Rock seemed to have been right. It was still a closed land. And it became a challenge I could not resist. One of the main reasons why the canyon remained unvisited was that since the Communist revolution in 1949 the surrounding areas of Jiulong [九龙] and Muli had been off limits to foreigners. Until the 1990s, they had been “closed areas” that required a special permit usually only granted to official groups on visits escorted by a Chinese government minder. So, while I remained curious about Muti Konka, it remained in the back of my mind as I explored other little known areas of south west China that I had learnt about from other articles written by Joseph Rock. I made a hiking trip from Lugu Lake [泸沽湖] to the former semi-independent kingdom of Muli that Rock described in “Land of the Yellow Lama” [National Geographic April 1925]. Again, this was “off the map” and officially a closed area, but I discovered that Rock’s sketch maps were still reliable and that the local authorities in these out of the way areas did not seem concerned by the arrival on foot of a permit-less foreigner. Instead of being ejected, I was welcomed and treated as a curiousity. There I discovered that the town of Muli, once the home of more than 700 monks, had been almost completely obliterated during the 1950s after the Chinese takeover. Its impressive buildings had not been smashed, but systematically taken apart brick by brick to be used in the constriction of a nearby village of Wachang [瓦厂]. The autocratic and idiosyncratic rule of the Buddhist monks – described in colourful detail by Rock - had been replaced with a functional settlement of breeze block buildings. And yet a few fragments of the monastery remained and were being restored when I visited, once again home to about 70 young monks. And across the mountains from Muli lay the Yalong canyon, so near, but still beyond my reach. The scale of the landscape was way beyond anything suggested by the empty spaces on the maps. 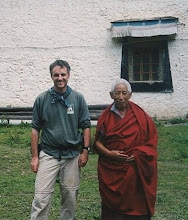 Emboldened by my initial success, I made other journeys throughout the nineties in the footsteps of Joseph Rock. From the Sichuan town of Kangding I rode on horseback into the isolated valleys surrounding the 7550 metre high peak of Gonga Shan [“Glories of the Minya Konka, NG October 1930]. Returning to the Muli area, the next year, I trekked the Buddhist pilgrim’s “kora” around the three sacred peaks of Yading 亚丁[Konka Risumgompa: Holy Mountain of the Outlaws; NG July 1931]. And in Yunnan I travelled from Lijiang to re-visit the great parallel river canyons of the Yangtze, Mekong and Salween in the north west of the province. There, I found that within the space of a 100km there was an amazing transition from the leech infested jungles of Burma, through temperate Yunnan forests up to the wild snowbound borders of Tibet [The Great River Trenches of Asia; August 1926]. On this blog you will find some of Rock's pictures and my modern day equivalents. Hi Michael, I really want to swap links with your site, which in my mind is the best resource on Deqin on the web. First of all, congratulations for your job on this bolg. It's a great project and your pictures are amazing. Thank you for share it with your readers. I'm from Spain, and I planning to go this summer to China. I'm interested to go to Litang Horse festival and take some days to visit some villages on West Sichuan Province. Please, could you tell me what about restricted areas to foreigners. Had you been some problems during your travels to this places? I'm not sure if it will be possible to go there this year (the last year ws suspended). Please, if I can't reach to there, could you recomend me some interesting places of tibetan culture in Sichuan or Yunan? I'm searching the contact with people and their culture in not touristic villages. Thank you for your fascinating blog. I traveled to Dali and up to the Gorge but unfortunately I got ill upon my arrival. I'm studying Chinese here in Ireland and wish to return as soon as possible. Hopefully in August I can get to Guangxi or beck to Yunnan. 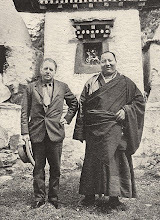 I spent far to short a time there but I did find out about Joseph Rock and his work with the Naxi. Like you I traveled with a Leica and with a digital back up. But everyone said the Leica pictures were much more authentic. Maybe someday I can have my own lab and process my own pictures. For the moment I will be returning to teach in southern China. I miss it so.. I had to return home to be with my father who is dying. You pictures and your stories are fantastic and a great respite form this difficult time. Maybe someday we can hook up and exchange travel stories..
Take care and safe travels.. I also am from Sydney and visited Wu Tai Shan and the Kyegu/Jyekundo/Yushu in the Kham region in 2007, where I spent 38 days in a solitary meditiation retreat at Kyegu Monastery. Our teacher here is the spiritual director for 600 monks and 100 nuns there. I really like your site and would like to link to it. My blog, www.askabuddhist.blogspot.com is about trying to remove some of confusion around the language of teachings for newcomers to Buddhism. Fascinating! Thank you for your blog, something i will follow from now on.